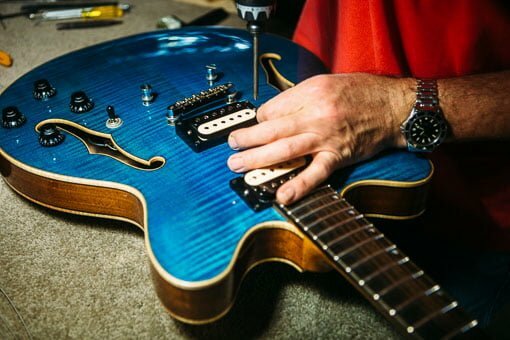 Melville Guitars is a fully equipped luthier’s workshop located in Kenmore, Brisbane. 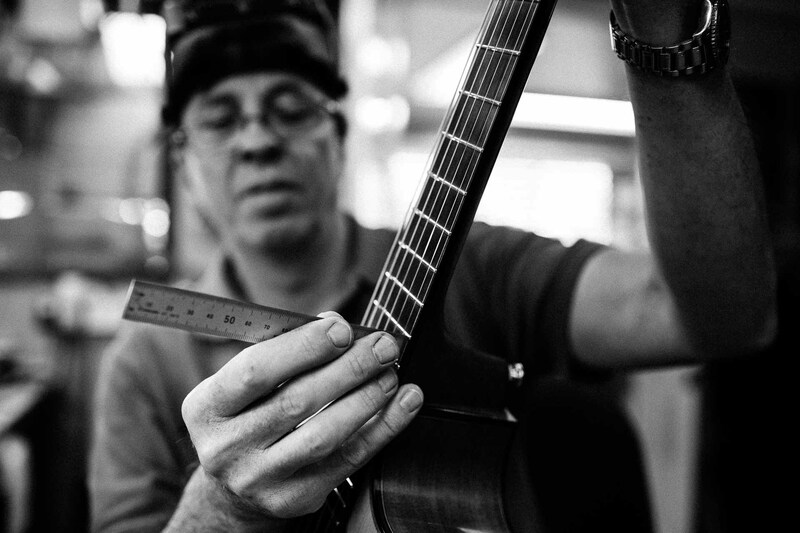 Guitar repairs and service have been a natural extension to guitar-building for Chris Melville. From his early beginnings in his grandfather’s workshop to becoming one who discovered his love for playing the guitar, to working with one of the world’s great guitar innovators, his depth of knowledge and industry experience adds another dimension to service and repair work. When matched with his crafting skills, it is a serious offer indeed for anyone wanting the most from their guitar-playing. An important facet of Chris’s approach is consideration of the other half of the instrument…the player. Being able to understand how they play, what they want to hear, in what context do they play and even their physical size is important in making the instrument work, but also, in making it ‘fit’ the player. This approach and understanding have made Chris Melville the first choice of musicians, guitar collectors and enthusiasts, Australia-wide, when it comes to servicing, repairing and extracting the very best from, their instruments. Melville Guitars is a fully equipped luthier’s workshop located in Kenmore, Brisbane. 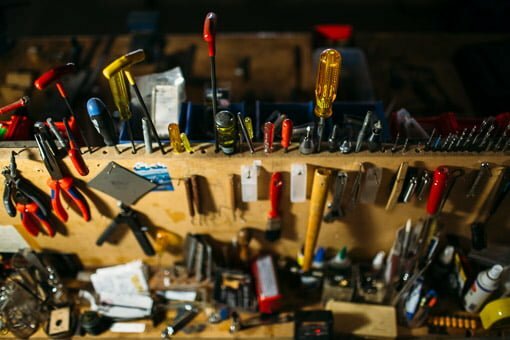 Guitar repairs and service have been a natural extension to guitar-building for Chris Melville. From his early beginnings in his grandfather’s workshop to becoming one who discovered his love for playing the guitar, to working with one of the world’s great guitar innovators, his depth of knowledge and industry experience adds another dimension to service and repair work. When matched with his crafting skills, it is a serious offer indeed. Fretwork and Setup are key elements to releasing the potential of an instrument. 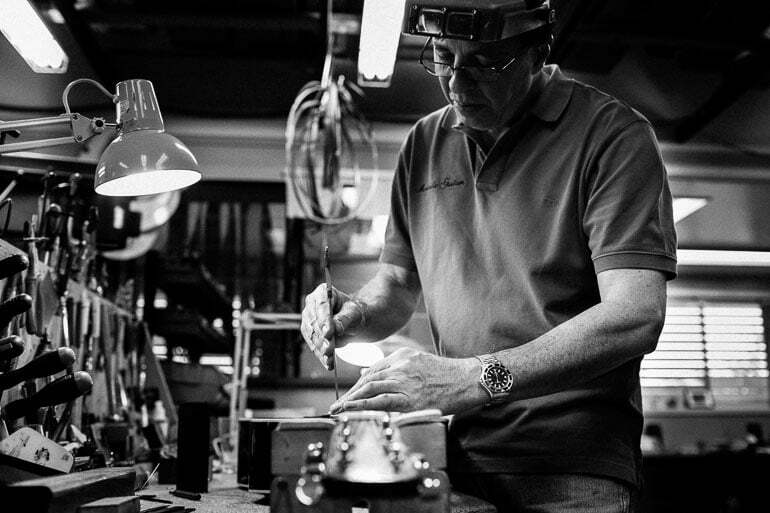 Chris Melville has established a reputation as a ‘specialist’ in this important area of making a guitar reveal what it is capable of. There are many small details and measurements to consider, and how each one is working and relating to the other will have an effect on the overall performance. Then you must consider the inherent qualities of the wood itself, the particular ‘recipe’ of that individual instrument, the construction parameters and materials it was built with and so on. This means that most guitars could perform a lot better than they currently do! 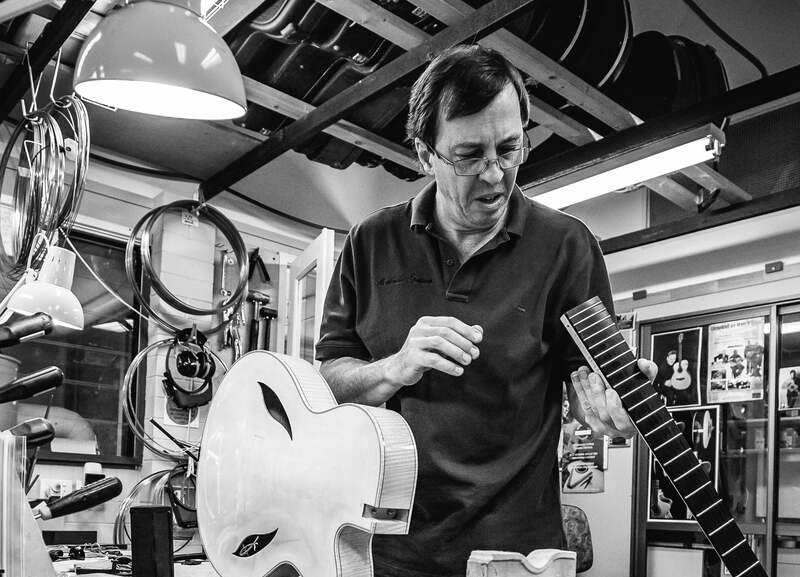 His deep knowledge and attention to fine detail in every aspect of fretwork and setup are what set him apart in the Brisbane guitar repairs scene and without a doubt, the best way to know that difference is to visit the workshop yourself. There is no substitute for being able to play his instruments and to meet Chris. 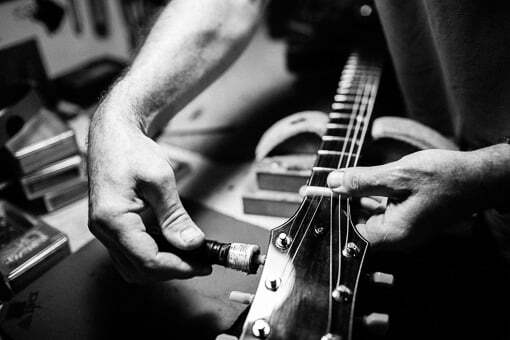 Setup, is a commonly used term in the guitar industry and refers to ‘setting up’ a guitar so as to make it ‘playable’. Most new factory instruments will need to be ‘set up’ simply because the process of manufacturing in such quantities, does not allow time for this detailed work. Whether it is an acoustic or electric guitar, bass, banjo or mandolin, it will need to be set up properly if the true capacity of the instrument is to be revealed reliably. Many musicians, both professional and amateur alike, are yet to actually hear what their instrument of choice really sounds like! Some might say this is a rather bold statement but when you are working with minute measurements impacting on each other, there is a very narrow window where an instrument really “sings”, or in other words, plays perfectly in tune with itself from the lowest note to the highest. Fretwork is without question, the very foundation of effortless playability, and essential to achieving a competent setup. To whatever degree the foundation, or fretwork, is compromised, the playability is likewise compromised. If the foundation is correct then the player can have pretty much whatever action their fingers, and their ears desire. There is a lot of misinformation and commentary out there regarding stainless steel fretwork. While there is a higher degree of difficulty in working with it and the appropriate tooling is necessary, it would definitely be our recommendation for moderate to heavy-use players, especially working musicians. It retains it’s accuracy better and outlasts nickel silver many times over resulting in lower maintenance costs in the long run. As a professional guitar player and teacher, keeping my guitars in top shape is of the utmost importance. They need to play effortlessly and sound special, every night, otherwise it’s really hard to play and feel my best. To be honest, it has taken me 10 years to find the guy who can do this for me. I’ve tried a lot of people over the years and I thought I was fairly satisfied but meeting Chris has been a total game changer. He has drastically raised my standards for what a guitar should sound and feel like. I hadn’t realized how compromised my instrument was and the effect that it was having on me as a musician. It’s like a whole new world has opened up for me and I’m thrilled about where it might lead! All these years I was striving to sound the way my idols do, wondering what was lacking in my technique and never realizing the crucial role that a proper setup plays in achieving it! Thank you, Chris. I am so grateful to you for bringing me to this place. I feel so much joy coming from my playing again and everything feels fresh and exciting. Highest recommendations! Upon playing it for the first time, this is what I found. The action felt very even all the way up the neck. Every note, on every fret played beautifully in tune, from a barred F on the 1st fret, all the way up. Amazing! The low E is particularly impressive: tight and responsive and it plays well even on the highest frets, no matter how hard I hit it. I have never experienced that before, but there was more; bending the top E string in the higher register I found something unexpected; the note would actually swell on the bend! 2 days later, I picked up the guitar for the 3rd time since the set-up and it was in-tune straight out of the case. All manner of bending and vibrato usage and still it stayed it tune! Now it seems I have to re-learn to play it as I had adapted my technique to compensate for the previous poor set-up. The acoustic guitar is my passion in life & has led me on a trail of discovery, trying to find instruments that have a sound I can get lost in. I’ve owned & do own some “high end” guitars in this pursuit. My Melville 000 has a depth & clarity to its tone & a timbre that I find hard to describe other than to say “see you later hours” when I play it. Beautifully even sound all the way up the neck & the feel is very easy & comfortable. The appointments are in perfect balance with the sound. The rose inlay & pau shell on this guitar is simply fantastic, not over the top, perfect. This guitar says, “play me well & I’ll take you where you want to go”. Chris has also upgraded several of my Martin’s and along with a favourite strat with his impeccable Fretwork & set up. They always play and sound so much better after a visit to Chris’s workshop. If you want honest appraisal followed by first class workmanship by someone who knows the physics and science of their craft, I couldn’t recommend him more highly”. 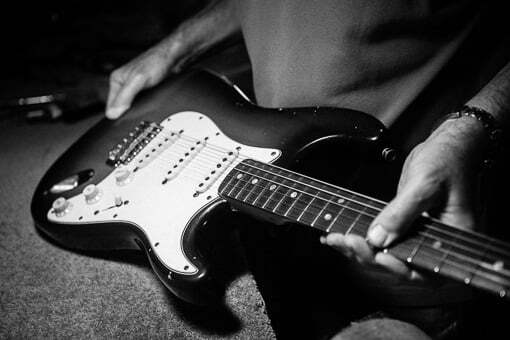 Does your guitar inspire you? Not everyone is in the market for a custom-built guitar but, certainly, every player wants a reliable, truly-musical instrument that is easy and inspiring to play. For those with a budget of around $2000, Chris provides a unique service in ensuring that they achieve that goal, first time. He holds in stock a limited number of individually selected factory guitars that provide excellent value at this price point. Starting with guitars that are soundly constructed and musically resonant, he then applies the same comprehensive setup that he does to his own custom-made guitars. The ‘Melville’ signature is effortless playability and remarkable tone. 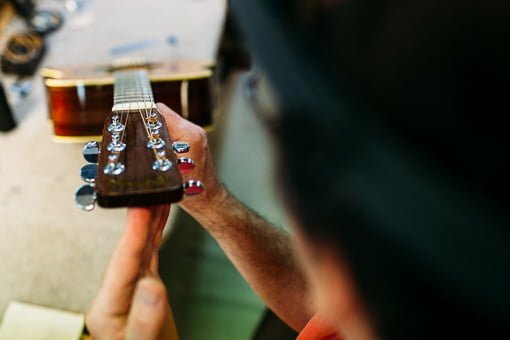 Having expert help in finding the right guitar for your budget will be the difference between whether you enjoy the instrument and are happy with your investment, or whether you give up in frustration and disappointment or are constantly looking for another one. The right guitar for you can absolutely make this much difference. Chris loves to demonstrate his guitars and to discuss what work you could benefit from at the Melville Guitars Workshop in Kenmore, Brisbane. Visits are BY APPOINTMENT ONLY. Please call or leave your enquiry details and he will be in touch.